Didn’t you hear – San Diego is a stand up paddle boarding mecca. Noted for its warm weather year-round and diverse coastline, this sunny Southern California city is a must-paddle for your paddle board bucket list. 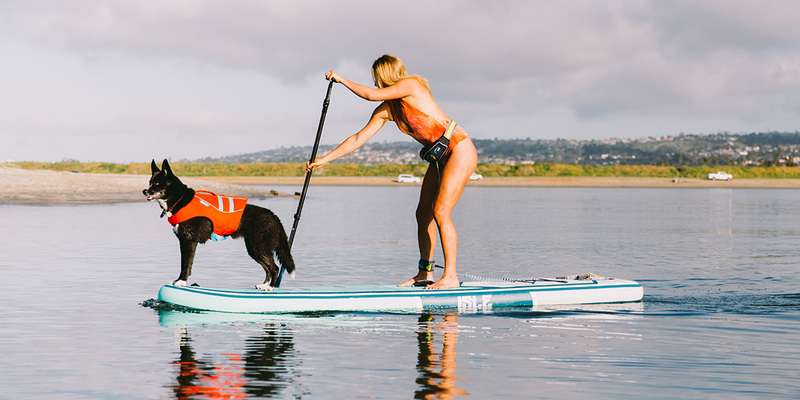 San Diego has everything that a paddle boarder is looking for – consistent waves for SUP surfing, an active SUP Yoga community and plenty of flatwater options along its coast. We are fortunate enough to be based in San Diego and have had the opportunity to explore every nook and cranny of its unique coastline. 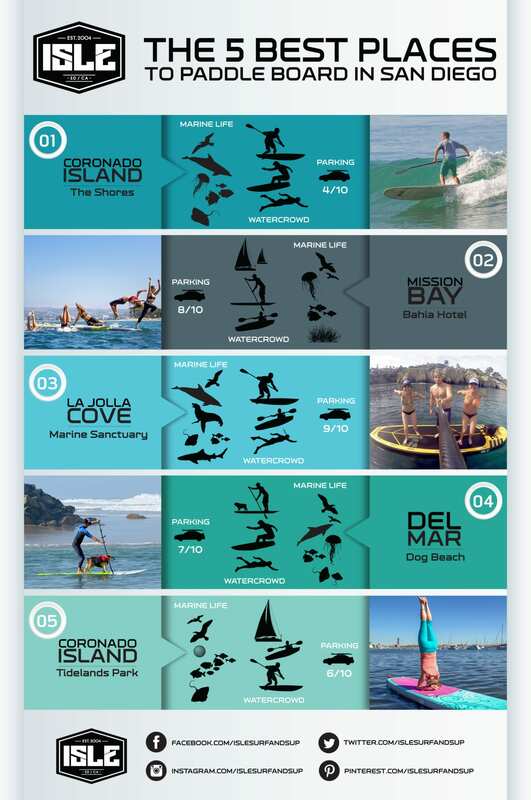 Below we list our top 5 favorite spots to paddle board in San Diego. Looking to score some waves on your stand up paddle board? Coronado will provide you with perfect long reeling lines and picturesque A-frames to shred on your surf SUP. Coronado is a quaint, little island situated just off San Diego’s coast. It’s only 5 minutes over the famous Coronado Bridge from downtown San Diego. San Diego’s naval base is situated in Coronado, and right next to it lies a couple miles of white sand beaches with multiple peaks ready to be surfed. Grab a friend and head over to the island for a surf session because it is totally a break you want to cross off your bucket list. Mission Bay aka one of the world’s largest man-made salt water bays is an excellent spot to sit back, relax and go SUP fishing. Located just 10 minutes from downtown San Diego, Mission Bay is local to many great coastal San Diego towns (Pacific Beach & Mission Beach). One of our spots on Mission Bay is Santa Barbara Cove adjacent to the Bahia Hotel. The Bahia Hotel offers easy to access to the bay with a giant, free parking lot. The cove is protected on three sides so it’s usually very calm waters even on the windiest days. On any given day, you can find paddlers fishing off their SUPs, a SUP Yoga class in session or possibly a whale sighting. La Jolla Cove is easily the most beautiful paddle board spot on our list. Paddle along towering rocky cliffs and witness the cove’s prosperous marine life. Watch seals sunbath on the cliffs and birds gracefully fly in packs along the shoreline. La Jolla Cove is one of the true Jewels of the San Diego’s coastline. While paddle boarding, you’re likely to encounter bat rays, leopard sharks, jellyfish, sea turtles and even real sharks (the harmless types!). 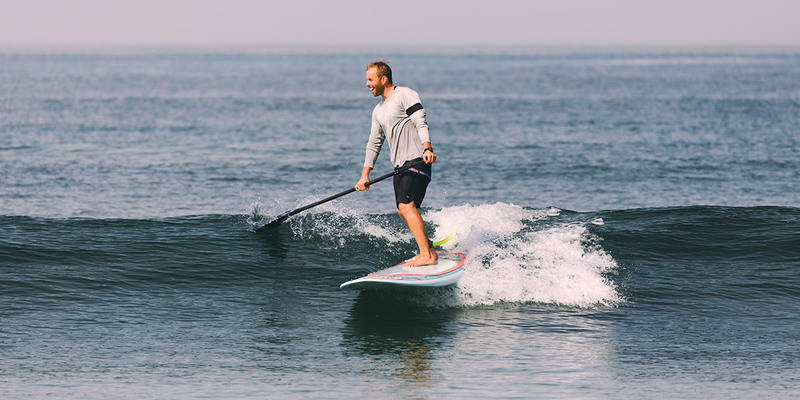 In addition, La Jolla paddle boarding offers an unparalleled view of the majestic cliffs and caves along the shoreline to compliment the sea life. Even when conditions are not perfect. it’s still one of the most beautiful spots to paddle in San Diego. 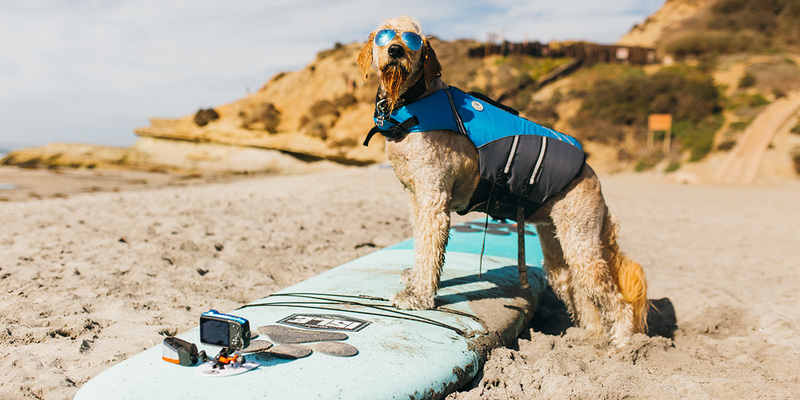 The spot that’s the furthest north on our list is Del Mar’s Dog Beach. This beach is a fantastic hybrid paddle board spot providing both calm waters that allow you to flat water paddle, as well as river mouth ideal for SUP surfing. Del Mar has maintained its status as a dog-friendly city since founded in 1959. North Beach, is known to dog owners as “Dog Beach” because it’s the one of the only beaches in San Diego that allows dogs (a section of Ocean Beach does too). The beach located north of 29th street and stretches nearly one half mile from the border of Solana Beach. One of San Diego’s best kept secrets is Tidelands Park on Coronado Island. 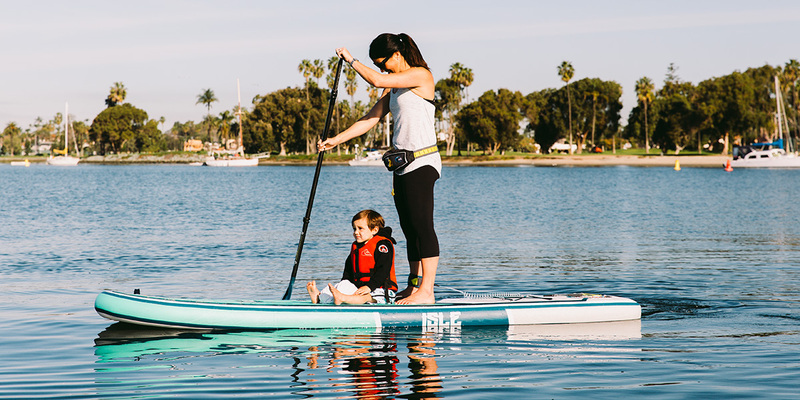 You can launch your SUP out of the bay and paddle around the enormous Coronado bridge while taking in the million-dollar view of San Diego’s high rise skyline and baseball stadium. When you paddle back under the bridge towards Coronado Yacht Club you will catch a glimpse of the Hotel Del — the largest wooden hotel in the world, constructed in 1888. Whether you’re a local San Diegan or visiting, you definitely need to cross these spots off your paddle board bucket list. Although these are our 5 favorite, there are so many more amazing places to tour, practice SUP Yoga, Surf or just go for a relaxing paddle.